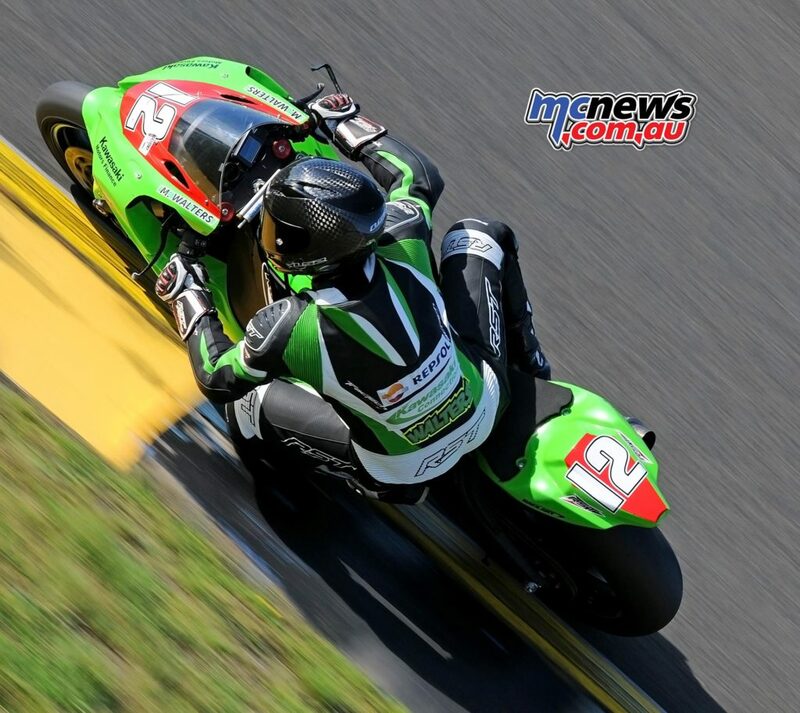 Marty Thompson spoke with Matt Walters ahead of this weekend’s third round of the Swann Superbikes series at Mallala Motorsports Park in South Australia. MT – You’ve managed to put together what appears to be a good package this year? Yeah, we have a new bike and with the backing of KMA, Kawasaki Connection in Cessnock, Kawasaki Motor Finance and my other sponsors, Repsol, LS2 Helmets, RST leathers, HM Quick Shifters, SBS Brake pads, plus my long time personal sponsor Rover Coaches here in Cessnock, we have managed to put together a competitive team. MT – It seems you guys have really stepped up this year. In terms of pace. What do you think is the main reason? Our bike is definitely a lot better than last year. That’s part of what we were missing in 2015. Plus I have suffered from terrible arm pump all throughout my career, especially last year on the Superbike, so made the decision to have arm pump surgery done mid-season, last year. That really Impacted last year’s championship results. This year I can now jump on the bike and race as hard as I can for as long as I need. I think the only thing stopping us from winning races this year is getting a bit more of an understanding of the new bike. We haven’t done that many race meetings on it so far, so are still working out how to get the best out of it. 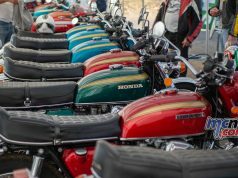 MT – What do you think are the strengths of this years bike compared to last? The handling of the bike is a huge improvement. It has bigger brakes which allow really hard and late braking, as well as a far better front end. So we have a lot better package to use at the harder braking circuits. The whole chassis and swingarm are also a big step up from last years model. The stability is great. But we are taking our time this year to work through set-up as we don’t want to make any mistakes and cost ourselves in the long run, so we have been easing into this year. 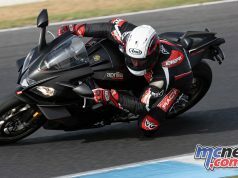 The bike has a longer swingarm and is much stiffer overall. This is giving us more drive off the turns and way less issues with the front wheel coming up off the corners. It’s made the bike a little more like a 600 to ride, in as far as it requires a lot less effort to muscle it around. It’s a much smoother bike to ride hard. MT – How have you gone with coming to grips with the electronics? The elctronics are really good straight out of the box. But It’s stuff we haven’t used much before, so it’s new to us and we are still really trying to work it all out. But it’s been a real strong point in the early days of it’s development. 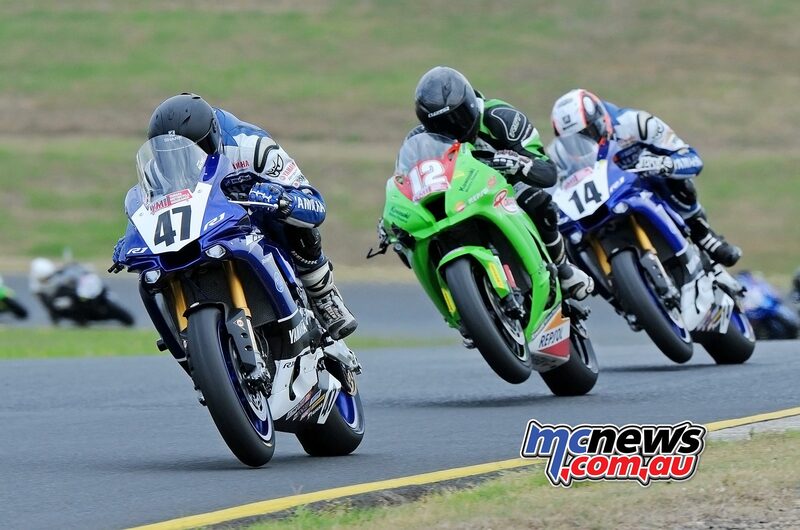 I think it will be a race winner in ASBK before the year is out. We’ve won a few already in FX Swann Superbike Series. I think there is a good chance of taking out the championship this year in the Swann Superbike Series. Although I don’t want to talk up our chances too early, as It is a long championship, but we are confident with the bike so far. In ASBK it will be a lot harder, as we are not doing all the rounds. We will most likely be missing out on Morgan Park, and possibly Winton also. Last year was easier, as everyone was in one and we could plan it out from there. MT – The bike appears to have some real power this year compared to last. Is it as fast as people are making out? The motor has a little more power and it’s defineitely a talking point as to how fast it is. It was up 5-7km/h down the straights at P.I. and Eastern Creek. At present we are pretty happy with it. But there is a little more to go with my riding. To be honest, the bike is a little faster than I am right now. We are moving forward slowly, tring to not make any mistakes and do it right. MT – Without the likes of Herfoss, Maxwell and so forth, have you guys in FX stepped it up a notch now that you are the main players? In the FX Swann Superbike Series this I think we are just as fast, if not a little faster. 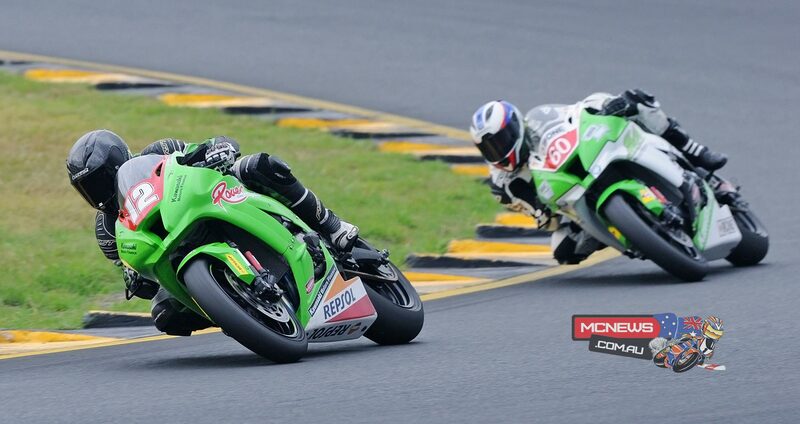 We are on different tyres, so it’s really hard to judge if we would be as quick or quicker than the guys in ASBK. 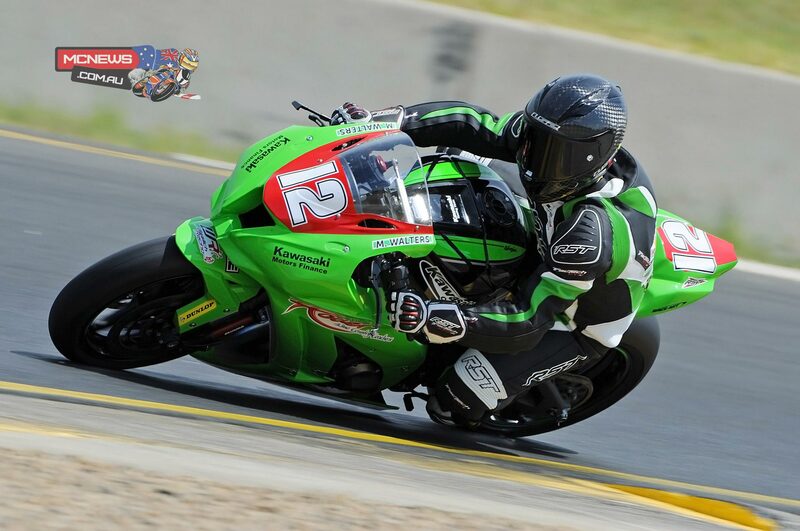 That’s why we are doing a few rounds of ASBK, so we can get a gauge on how we compare to those guys. MT- – By the sounds of things, you appear to have a two-year plan with this bike and your current team? We are trying to spend at least the next two years racing here in Australia before thinking about heading overseas. I had a terrible 2014. So I want to try and win a championship before even thinking about going O.S. I’m only 23, so I still have plenty of time to get it right before I start thinking about heading to the big leagues and jumping on something that is a bit alien. I would probably like to go straight to Europe. Maybe in WSS or WSBK. However, I’d consider BSB or AMA, but I think I’d really like to go to Europe in the end. But any path that is possible would be great. MT – So have you got any wood on the other guys in the field? I think it’s best to just keep your mouth shut and get on with the business of riding the bike and we’ll be right. Keep the mouth shut and the throttle open and life is a little bit easier. MT – With Mallala only a few days away, how are things looking? I’m very confident that we will be up there fighting hard for the wins. I would love to come away from this round with a strong result, and believe we can win if things fall into place. 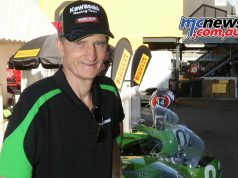 MT – Thanks for taking the time to chat with MCNews.com.au Matt and good luck on the weekend. Thanks a lot for having a chat with me and keeping our name out there, it is very much appreciated.